Re: ORDER YOUR ROTATO EXPRESS HERE!!!! 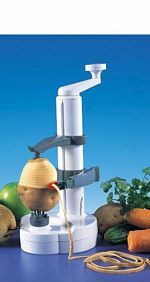 The rotato express is also available through the "The Rotato Express Electric Peeler Dealer" at a very competitive price. I also carry replacement blades if you are in need and yes they do fit the old dazey strippers as I tried it in my dads old dazey and it worked like a charm! Please see my website(listed below) if you are interested! ORDER YOUR ROTATO EXPRESS HERE!!! !